Sally Swift (with Tom Baker, partner at DAC Beachcroft and actress Sally Phillips). Sally Swift, Head of Legal Support Services at Nottingham firm Browne Jacobson, has received a national award for her commitment to promoting lifelong learning and improving greater access to the legal profession. 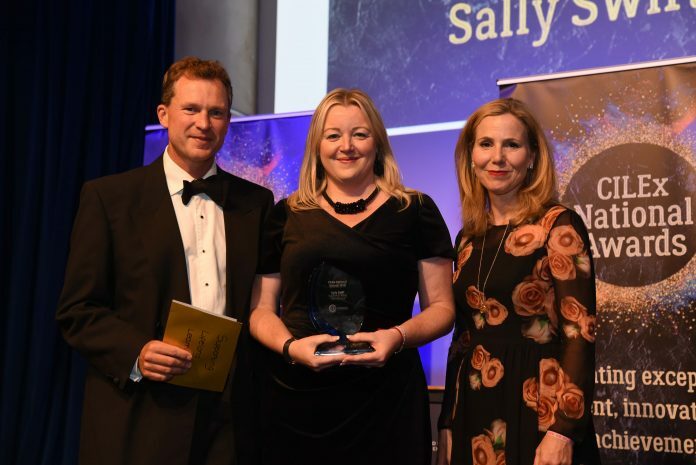 The ‘Supporting Lifelong Learning Award’ was presented to Sally by The Chartered Institute of Legal Executives (CILEX) at its inaugural awards initiative which recognises and celebrates the work and achievements of professionals who have promoted access to the legal profession. After joining Browne Jacobson in 2012, Sally pioneered one of the country’s first legal apprenticeship schemes at the firm’s Nottingham office. To date the firm’s programme has supported more than 20 young people in entering the profession. Since its launch Sally has gone on play a pivotal role in shaping how the firm develops and nurtures new and existing talent. She has also gone on to advise government, the Department for Education and Skills for Justice on developing nationally recognised apprenticeship standards in partnership with bodies such as CILEx, the Solicitors Regulation Authority and the Law Society. She has also worked closely with business and educational organisations such as the CBI and Nottingham Trent University as well as local schools across Nottinghamshire promoting apprenticeships as a viable route into the profession. Earlier this year Browne Jacobson announced the launch of a new apprenticeship programme that will see 100+ apprenticeship positions being offered across the firm’s offices and will see the firm invest 100% of its apprenticeship levy into the new programmes.